Infinite Iron in a 100% automated fashion. As seen here, I have a deployer set up to fill the buckets in a 3x3 water lake (2x2 can sometimes stop working.) A filter set to only take water buckets will send them into the top of the furnace. The timer is set to pulse at 0.75 second intervals to keep speed and minimize lag. 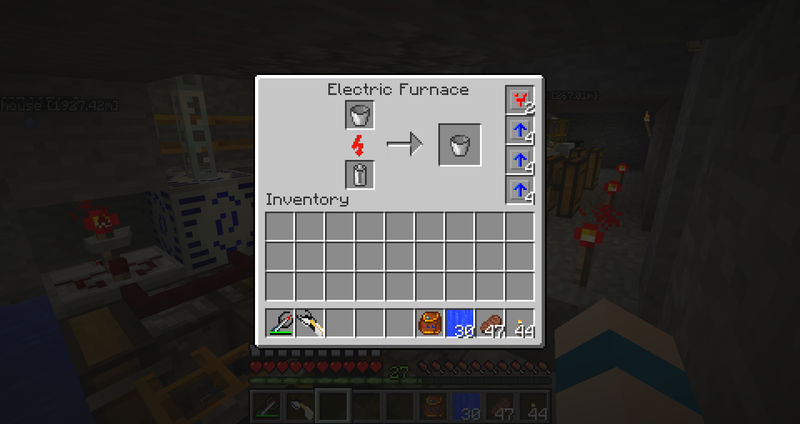 As said before, the smelting process gives you two buckets. The right bucket is pumped into the next stage, while a retriever takes the empty bucket back to the deployer. An empty battery is in the bottom slot to prevent the pneumatic tubes from trying to pump things into the bottom and every machine in this contraption has the same amount of transformer and overclocker upgrades. 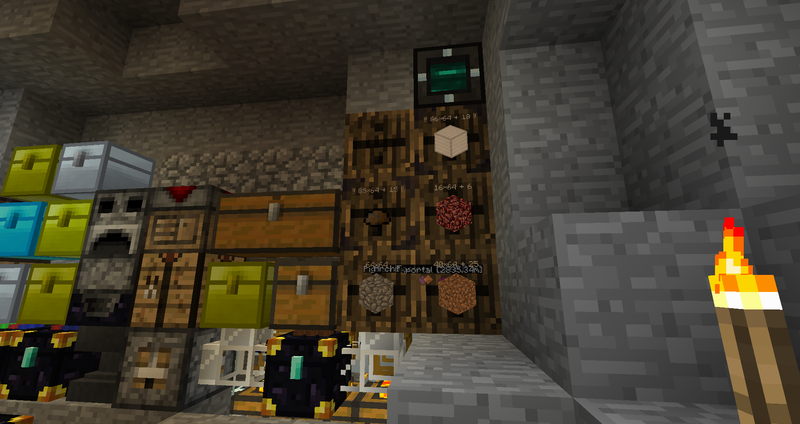 Finally, the items are transferred from the receiving tesseract into an upgraded barrel. 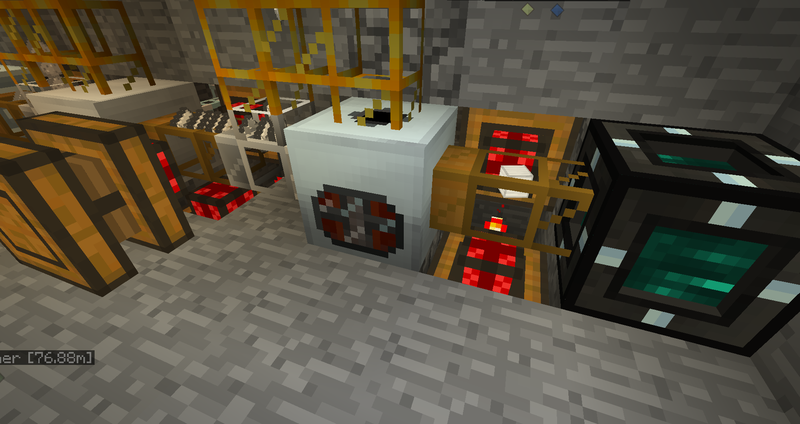 As you can see, I no longer have to do anything to make this process work and while alloy furnaces can turn the water buckets straight into ingots, they are a lot slower and require blutricity (which is harder to get and set up than EU in my opinion. If you have any questions, feel free to ask. Holy **** it works, not that iron is hard to get by, but this is an awesome exploit, you could make your setup even simpler by using an Aqueous Accumulator and a Liquid Transposer to fill your buckets. 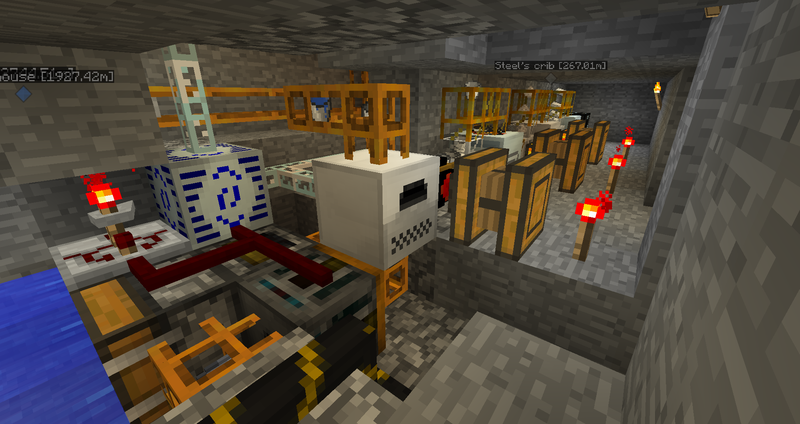 The Liquid Transposer works with RP2 pipes, and since you prefer RP2, you can even use a blutricity engine to power it. Anyways, nice setup, I'm going to make my own automated duper using TE and RP2. Hehe. Sounds like a plan. I'll have a look into the blocks for speed and such. Though I'd probably be using electrical engines as I can't get rid of my EU even with both my factory and house's solars being hooked up to matter fabricators. The amount of solars you need for fast blulectric engine is ridiculous. Wouldn't it be easier to make a tier five iron golem spawner? You get a one kill iron golem shard, and use an anvil to combine it with a tier five other mob spawner and POW! tier five iron golem spawner. You can combine shards on an anvil? I didn't know that. I guess so, but that seems like a waste of a shard. After all, each one is a third of a diamond. Not if you have alot of diamonds. Is 1/3 of a diamond worth infinite iron? It totally is. Also, the iron golems isn't a bug, so it cant get fixed. the furnace thing could get fixed, and draws EU. Is 1/3 of a diamond worth infinite iron? I dont think so. Also, the iron golems isn't a bug, so it cant get fixed. the furnace thing could get fixed, and draws EU. EU is virtually free, but yeah, I'm sure the developers is aware of the dupe bug and will probably get fixed, if it isn't already. Iron golems cannot make soul shards, I tested this. But there is a mob in the twilight forest that can drop iron boots and picks, so with a grinder and alloy furnace you can get infinite iron. Also, this works with zombie pigmen for free gold. Does this work with all the packs. Couldn't you just breed a bunch of bees. You can get anything from bees. It doesn't require that much effort to get to an iron bee. Yes, this should work with all the packs with IndustrialCraft2. But the way this works is that the Water (and Lava and Milk) Bucket has a bucket as a 'ContainerItem'. A ContainerItem is basically the thing it will transform into when it is used in a recipe. So when a Water Bucket is used in a recipe, it always turns into a bucket, and this can't really be changed. So because the recipe dictates that when a Water Bucket is smelted the output is a Bucket, it returns two buckets because the Water Bucket's ContainerItem is a Bucket, and the recipe tells the Water Bucket to give a Bucket as the output. The crafting recipe of a Cake requires three Milk Buckets, two Sugar, three Wheat and one Egg (I hope I got that right). The ContainerItem of the Milk Bucket is a bucket, so you get three buckets back when you craft a cake. When a Minium Stone is used with Cobblestone in a crafting grid, Grass is produced. The ContainerItem of a Minium Stone is a Minium Stone with a damageValue of one more than the existing Minium Stone, so it will take damage, so you get back the Minium Stone when you craft with it, but with damage. The crafting recipe of a Logic Matrix Programmer requires a Logic Matrix Programmer, a Dark Iron Ingot and a Logic Matrix. When it is crafted, the Logic Matrix Programmer is made and the other Logic Matrix Programmer stays there, because the ContainerItem of a Logic Matrix Programmer is a Logic Matrix Programmer, resulting in an intended duplication. This is also why streak1's exploit works. Excessive power drain during EU conversions?